Dr. Mozhdeh Shahbazi wants to make it easier for drones to fly — even in areas where GPS isn’t reliable — places like street canyons, indoors, and even forests. Shahbazi received her BSc degree in civil/surveying engineering in 2009, her MSc degree in geomatics/photogrammetry engineering in 2011, and then moved on to doing PhD research focused on the development of drones for 3D modeling at the Université de Sherbrooke in Canada. She is currently an assistant professor of geomatics engineering at the University of Calgary in Canada. Drone Girl: You’ve done incredible work based on enabling drones to know their environment without the use of GPS. What does that entail? Dr. Mozhdeh Shahbazi: I’m working on different types of sensors for autonomous navigation – those based on vision and those not based on vision. The ones not based on vision I cannot discuss because they are confidential! But the parts based on vision are more exciting. They include laser scanning, which is a type of active sensing. Measurements are done from a type of instrument which sends laser beams to objects and calculates its range from them. Then there are visual sensors. Cameras don’t measure depth, so what I’m working on is multi-view stereo. In the case of a drone, we set cameras on all sides so we have a 360-degree cover. It’s important to shoot the front, back, side and ground. And because of bird attacks and to be aware of other aircrafts, it’s important to have a view pointing up too! DG: Bird attacks?! Is that an issue? MS: Depending on where you are flying, the birds see drones as enemies —especially the fixed wing drones that are smaller, because they fly like birds. DG: I have to say, I have lots of experience with birds not liking my drones. I fly in San Francisco and we have lots of seagulls. So, back to autonomous navigation. Why would one need this technology? MS: For example, someone using a drone in forestry — it’s very difficult to rely solely on GPS because you could be covered by trees and wouldn’t have a clear view of the GNSSsatellites. DG: Really — even forestry? I thought that this was more of an issue with buildings. MS: Yes, because of heavy tree coverage, the number of satellites seen by the drone may be reduced, and the drone can likely only see the satellites when it is flying over and above the trees. 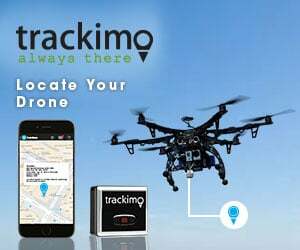 Instead of the GPS signals going directly from the satellite to the receiver — in this case the UAV — the signal is reflected multiple times by different objects. In an area of buildings and trees, those signals become reflected many times, making the distance between the satellite and the UAV seem larger. Thus, the odds become higher that the position will be incorrect. DG: So are you working to replace the requirement of GPS on drones? MS: We don’t want to eliminate GPS. But where it doesn’t work, it needs an augmentation technique so the UAV can tell where it is. And if you want to eliminate the pilot completely, you need techniques to figure out what the objects around it are. DG: How did you get into this? MS: I got into UAVs in 2012. My background is in geomatics and I’ve always been interested in the mapping side. I’ve been working at my master project on mobile mapping systems. I’m particularly interested in infrastructure inspection. The notion of autonomous navigation and precise navigation is important. To get high accuracy in 3D reconstruction and mapping, you should be close enough to the objects. You cannot rely on non-differential GPS solutions to get close enough to an object. For building inspections, you’re always close to a building so the chance that your position based on GPS is accurate is not high. I was discussing this a couple of years ago at a drone expo in London. I.e. that we need drones to be aware of their environment, like humans, from resources within themselves, and not rely on external data so much from third part machines like satellites. As computing power increases this becomes more viable.